Russia presents an enormous opportunity for international fashion retailers. An exploding middle class with both the disposable income and strong desire to shop internationally makes it an ideal market for fashion retailers looking to expand globally. 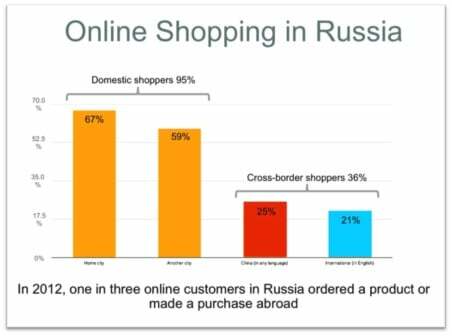 Yandex's latest research shows that more than one-third of Russian online consumers have made a purchase from an international online store. 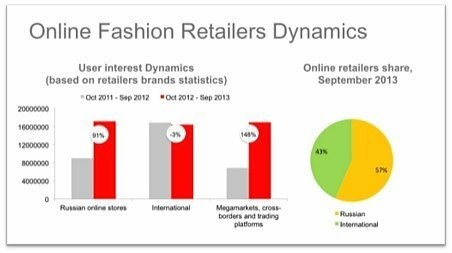 International brands currently occupy over 40% of the online fashion market in Russia. Recent growth has been with the domestic market as the local brands become savvier in their online offerings and become more competitive. Strong opportunities still remain, however, for international retailers who want to satisfy Russian consumers who are looking for unique international fashion items that aren't available from the domestic players. Bonprix, Otto, Quelle, and ASOS are among the international brands that already occupy strong positions in the Russian market. Local Russian players like Wildberries and Lamoda have grown strongly over the past 12 to 18 months, but there is still much untapped potential in this fast-growing segment of the online market. 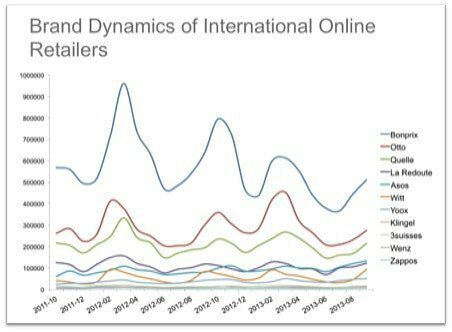 As in any market, there is a strong and predictable seasonality to the online fashion market in Russia. The Spring season tends to be centered on March, and the Fall season tends to peak in November. The existing international brands in the market have seen relatively stable interest over the past two or three years, while the overall market has seen strong growth. The expanding market leaves room for new entrants with strong offerings for the fashion-conscious Russian shoppers. Russian Internet users differ significantly from any other country, and this along with other factors make Russia a difficult market to define. When it comes to goods searched for and bought by Russians, the contradictory nature of opinions on both domestic and foreign products makes them notoriously difficult to target. At first look, Russians tend to be more attracted to foreign products. The biggest reason for this is that they perceive foreign products to be of higher quality than comparable domestic products. The online market for foreign products may, therefore, be a desirable one for new entrants. However, there are stark contradictions in Russian opinions; although many perceive foreign products to be of higher quality, there is also some belief that foreign businesses offload inferior goods to Russians. Due to problems in the lack of quality of domestic products, Russians have often preferred to purchase foreign goods. However, a recent study of Russian consumers found that 45 percent believe that domestic brands understand Russians better. In particular, Russians favor homegrown products within the food and drink markets. This is believed to be for two reasons: firstly, they know where the products come from and believe homegrown food and drink are more authentic; and secondly, it gives them a sense of loyalty to homegrown products. Despite this preference in domestic products within these industries, there is still some doubt about the perceived quality of these products. One thing is clear, though: when it comes to luxury items, Russians prefer Western brands. As well as desiring imported goods, Russians tend to categorize products differently depending on the country of origin. For example, Italian products are viewed as fashionable, products made in Germany are thought to be more reliable, and French products are often linked with romance. This highlights Russia's preference for other European products, as the most searched luxury items are French or Italian and the UK comes in fourth place. Luxury items are the most successful foreign products in Russia. From watches and cars to clothing and beauty products, the high perceived quality of these items has helped them gain popularity in the Russian market over their domestic counterparts. Due to the apparent popularity of foreign products, some Russian brands have adopted Western-sounding names to give them the same perceived value as the foreign equivalent. This has proven to be successful in both the fashion and technology industries. Interestingly, however, Western brands have entered the Russian food and drink industries through local traders with no clear association to the parent company. This highlights the importance of understanding Russian consumer preferences for domestic and foreign products, as these can vary greatly across different industries. Russians can be difficult to target due to the inconsistency in their product preferences, however; for foreign entrants looking to penetrate the Russian market, they are likely to find success with luxury products. In contrast, homegrown brands are most likely to have success in industries where the authenticity of the product is essential. With such a vast online audience and huge growth potential, understanding Russian purchasing habits may have enormous financial gains for current and prospective new businesses. Interested in learning more about the Russian online market? RussianSearchMarketing.com is your source for the latest news and information on the Russian digital advertising market.